Is there anything in the world that looks cozier than these Chilean-made wool and salmon skin house shoes ($59)!? These puppies make me want to make a Hot Toddie, light a fire, put on a 1990s rom-com and let the good times roll. They're made from the local soft hair of Patagonian sheep and tanned natural salmon skin, an up-cycled fabric made from what the fishing industry would otherwise throw away. Our amazing sponsor Kaufmann Mercantile (we're doing some really fun stuff together over the next few months, like this curated gift guide!) is giving a pair away. To enter the giveaway: leave a comment below! Winner will be announced Tuesday evening (11/11). Good luck! E-mail me lizziegarrett(at)gmail(dot)com to claim your slippers. These look so cozy! I've never heard of tanned salmon skin before; what an interesting idea! I'd love to try a size small out for myself. Those are interesting. I never thought you could use salmon skin as a leather-type product. Now I'm intrigued. Lovely! These would definitely be my winter work from home staple. Wait, so these are real salmon skin?? At first glance, I thought it was just textured... but wow. And they do indeed look very cozy. I dig it! They look super cozy. super cozy! I'd pair them with some mulled wine and jingle bells! Love! These would definitely be a treat to come home to this winter! These would be perfect for keeping my toes toasty on my cabin wood floors! I would pair with a mug of nearly scalding cowboy coffee, a brown eyed someone, and a game of strategy. These are gorgeous! I've never seen salmon leater, very cool. These look perfect for another East coast winter! would love to take these to Patagonia with me this winter!! These shoes make me want to move back to Nova Scotia. I miss being cozy in the cold. Those salmon scales are beautiful!!! These look perfect for keeping my feet warm on our cold tile floor this winter! Those look and sound (salmon skin, what?) incredible. They make me wish for colder California weather! So cozy... And unique! I've never seen anything like them! They are very beautiful and pretty..Would love have these cozy pair of shoes. wish to win it. Keeping my fingers crossed!! oh! i have been eyeing these slippers for months! my cold cold feet would LOVE to win these!! thanks for sharing!! I'd love to flaunt this beauty. They are classy and gorgeous. Fingers Crossed! I'd love to cozy up by the fire with these! I love these! I've been eying them for a couple years, waiting for my ll bean moccasin slippers to wear out enough to justify the purchase. Love those. They look so cozy - makes me wish for even colder weather! These handsome slippers are the perfect thing for another snowy Montana winter. My feet literally just told me they want to dive into these slippers. I work from home half the year and these would be perfect to scuff around in. And I never even knew you could make shoes using salmon! I've never seen wool and salmon skin house shoes, neat! Yes please!! Thanks for the awesome give away!! These look beautiful! The salmon skin soles look so interesting. growing up we used to have booties that looks like this that we would use to keep our feet warm in the winter in my house. we used to buy them from a family friend one day my mom made the mistake of washing them unless they were all too small can only for the baby's feet but I would love to have a pair of these again. Let the cold temperatures arrive! I love these. I have no heat in my home, just a fireplace, these would be wonderful to fetch wood in and then read by the fire. Oh my...I have been lusting after these for years! I love your blog and I'd love to win a pair of these! These would be perfect for the Wisconsin winter that's coming! SO COZY! I know someone who'd love this under the tree next month! amazing! i've been in the market for new slippers! Beautiful! I could definitely use these on our hardwood floors when I'm home with our first baby all winter. These look so toasty and comfy. Book. Fire. Wool & Salmon Skin House Shoes...the perfect winter! I would swim away to dreamland in these! These look amazing -- I love finding unique products at Kaufmann Mercantile. Thanks for the giveaway! ah! i was just lusting after these on friday. would love to own them for this winter! Wow, these look fantastic! Like a lot of other commenters, I never knew you could do this with salmon skin. Excellent, I'm all for upcycling! How fitting to announce a lucky winner on 11/11! Gonna be hoping it is me because these look bomb. Need to replace my Armor Luxe slippers (which replaced my LL Bean slippers), all Tomboy Style approved! Brilliant way to recycle left over materials... I need studio slippers. Such cozy slippers! Fingers crossed! A much more sustainable option to the ubiquitous sheepskin. Love them! i would like to gift these to a lovely young farmer who will be delighted by their natural beauty and warmth. Perfect for Montana winters! These look like heaven. I saw these at Toast in the UK, they are great. My mum would love these! Her feet are always cold, even though we live in the deep south. beautiful and cozy looking shoes! Wow...very resourceful with a cozy-looking result! I was just slipper-hunting this weekend and did not find what I wanted. These might just be it. I adore these! So lovely. ahhhh! my toes did a little dance thinking about these bad boys on my feet! adorable! And I agree, cozy up next to a fire, slippers on feet, wine in hand, doesn't get much better! Very cool! These speak right to my Scandinavian heart, and I would love to have a nice pair of house slippers for this winter. Love seeing all the cool creators you bring to this site. Your dad's old scotch plaid flannel shirt, your Grandma's Irish fisherman's cardigan, black leggings, warm wooly camp socks, a cashmere blankie, a hot toddy, a good book, and these sweet slippers for a chilly winter night in. I'm pregnant, so I could really use these shoes for the wintertime! 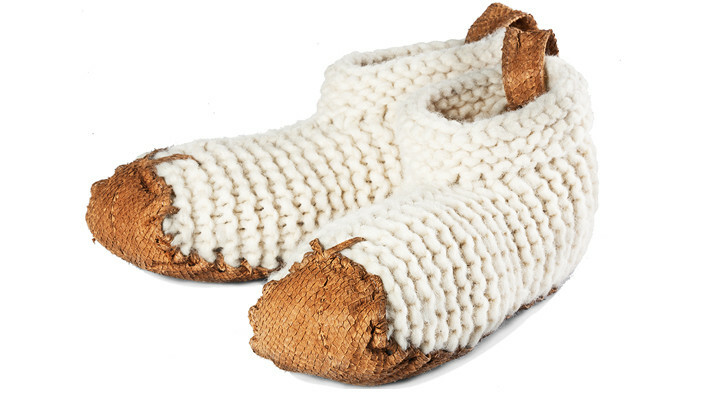 I've had my eye on these for a while, as I love cozy, well made slippers. They look really fantastic. Cozy feet are something a prairie dweller dreams of during the long frigid winter. I'm also really curious about the salmon skin. These look soooo cozy! Perfect for the upcoming Nordic winter. Fluffy fish slippers! Could get my funky salmon on! Yes please! These look so cozy and perfect, I'd just love to win them. Thanks! So gorgeous! They look like they would be perfect for winter here in the countryside, a nice fire, a big mug of tea and laughing with friends in my cabin- perfect! A nice contrast between soft pale cream upper and the tan texture of the salmon sole, so nice. These are so cute I would wear them all the time! Oh my gosh. We just moved to Minnesota and got our first snowstorm (am actually home from work right now because of it!) and those slippers would make my life so much nicer. When a sock and a slipper spent a romantic weekend together, ice-fishing in Juneau . . . These look perfect for the impending frost of winter months! I'm so curious about the tanned salmon skin! 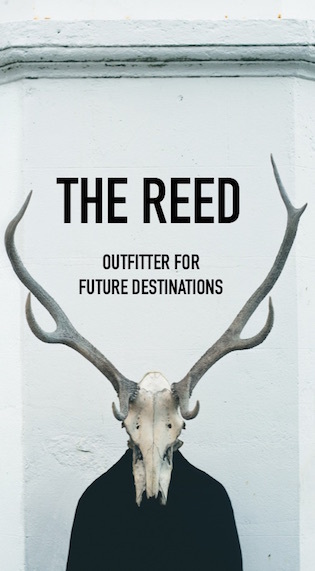 And can't wait for Reed! They look amazing! Ridiculously cosy! How snuggly these look! With winter settling in today for the long haul, I would love to cozy up with these keeping my tootsies warm! These are so cool - my feet are intrigued. These look amazing. I've been wanting something like these! Too cozy! I would love these. These fish shoes would look great on my feet. Around this time last year, I acquired a pair of the L.L.Bean Wicked Good Slippers upon Tomboy Style's winter slipper recommendation. I am happy to see this year's slipper suggestion, and I love how rustic and warm they look. Good luck to me and all the other commenters! Those look good. real good. I can think of nothing smarter to say. Wow! What a dream for those of us with poor circulation, especially in the wintertime. Those look like foot heaven! I'm really curious about the salmon skin! Those are beautiful. I would love a pair. I was just eyeing these!! These slippers would be perfect for my cousin who lives in Sapporo! She gets much colder during the winter than I do in Los Angeles. it would be like if my feet could eat a jar of nutella.. Aahaa!! makes me wish for winters in this warm country. Would love to carry it with me when I travel to Europe this december...and snuggle in my partner's cosy place in these. I so want these please! these are beautiful. they look soft, warm & cozy. would also look good with my lap-top salmon skin cover. Gorgeous. So cozy and wonderful! The truth about cats and dogs could only be better with these on my feet. My pregnant wife needs these. If I don't win I might still have to get her some. they are so hyggelige (danish meaning cozy (sort of)) i think they would keep my feet warm in the cold nordic weather. crossing my fingers. awesome awesome awesome - super cool use of repurposing! Water water everywhere, thank goodness for salmon and sheep. AKA Greetings from the polar-bombed upper midwest.